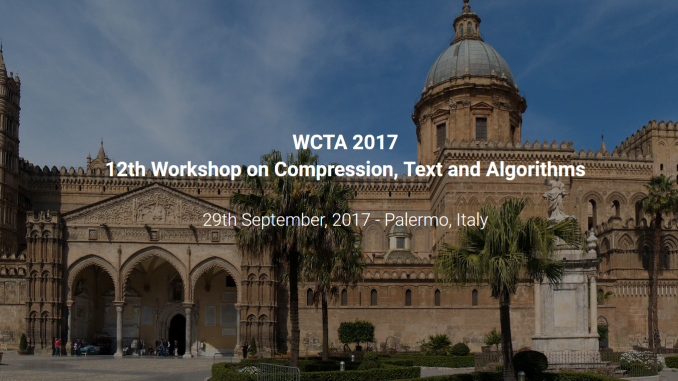 BIRDS will provide travel grants to all students presenting their work at WCTA 2017, the 12th Workshop on Compression, Text and Algorithms (WCTA), which will be held at Eurostars Centrale Palace in Palermo, Italy, September 29, 2017, the day after SPIRE’17. WCTA is an annual satellite workshop of SPIRE mostly focusing on compression, data structures and string processing topics. WCTA is free for all attendees. Thus, travel grants can be used to cover transportation, meals en route, hotel room in Palermo and meal at WCTA. BIRDS will provide grants for all students with an accepted abstract. If the demand exceeds the available budget, travel grants may only cover a portion of the travel expenses. We remind that the deadline for submitting an abstract to WCTA 2017 is: August 25th, 2017, anywhere on Earth.